Whilst selecting photos for the Zenfolio site (hint, go and browse), found this intriguing specimen in our collection that Ted believes will be a challenge ! SOC 342 No. 2043 Standing, without tender, at the dockside. The engine is painted in a strange livery, perhaps photographic grey, which has broad strips along edges and narrow lining with square corners. 'Cauliflower' on splasher, lining on wheels. The engine was built by Beadmores of Glasgow and was the last LNWR 'Prince'. Birkenhead docks. 1922? Can we expand on the description - why was it here in this special livery ? A start... Loco 2043 was first in service 04/1922 and received it's LMS number 5844 03/1927, then on the duplicate list as 25844 form 05/1934. Withdrawn 09/1936 and scrapped at that time after 14 years and 5 months service. This looks like a version of the Midland Railway livery, and so may perhaps be an early try out before LMS livery was decided. 1922 - merger with L&Y something to do with it? Some sources say that " Prince " no 2043 was built by Wm Beardmore in 1924 for the British and Empire Exhibition of that year, it was bought by the L M S afterwards. The livery is Midland red ,colour photos of the Midland Compound correspond Wm Beardmore had a large portfolio of engineering from aeroplanes to ships, cars to railways, perhaps the exhibits were gathered at Birkenhead for rail transport to Wembley? Some confusion here, I fear. C. Williams gives 2043 as built by Beardmore in 4/1922, just as other lists, right up to Baxter. The engine in this photo carries an LNWR numberplate 2043 and the LNWR crest, so can hardly be destined for Wembley in 1924. In any case, the Beardmore 'Prince of Wales' (LMS 5845) built for the exhibition had outside Walschaerts gear - a "Tishy" - so isn't this engine. I'm puzzled by the livery, but IF the photo shows 2043 when brand new in 1922, Midland red seems unlikely. If it was taken in early 1923, maybe painted red for some LM&SR trial of various liveries - as British Railways did in 1948 - the LNWR crest seems inappropriate. And why would the engine be at Birkenhead, or wherever? The obvious reason for a loco in this condition and without its tender to be on the quayside at Birkenhead Docks (or any other docks?) is that it has just been delivered by ship � from Glasgow? � or it is about to be sent somewhere by ship. Birkenhead was more commonly used for this purpose than the Liverpool docks. This livery has too much in common with the Midland livery - square cornered panels for example, not to be based upon that style. However, it is not the livery adopted for the LMS, since close perusal shows that the boiler bands are black, with the edges (presumably) lined in yellow. The LNWR crest is an anomaly, but if this was done in very early LMS days there would not have been an LMS crest available, so perhaps the old crest was used as an example to show what a crested loco in this livery would look like more closely than if the space were to have been left blank. I believe the Midland livery was chosen very early in the LMS era - when? Then there is the date of issue for the LMS round emblem - firstly having (presumably) to have been approved by the College of heralds. The first LMS locomotive livery applied to Crewe locos used a red round-cornered rectangle of the size of the old LNWR brass loco number plate - with what seem to be LMS rendered using carriage lettering. Next, the cabsides recieved LMS carriage roundels - in both cases the decision had been taken (when) to apply numbers to the tenders - with farcical consequences, this scheme being dropped in 1927. And, there was the question of how the locos were to be renumbered, so when was this decision taken? It all looks to me to be, as Harry intimates, to be a very early trial of Midland colours applied to an LNWR loco, presumably at Crewe where the loco may have been conveniently sent for some minor repair during early 1923. The Crewe paint shop was still operational in the very early LMS period, prior to closure during Beames' installation of "The Belt" method of loco overhaul. Everything points, in my opinion, to a very early trial of Midland livery onto an LNWR loco by Crewe. Interestingly, Bing re-liveried their 0 gauge George V 4-4-0 into Midland lake with lined boiler bands, as seen here. Being tinprinted, this model's livery was never corrected, and it subsequently appeared, c 1926, in LNER and GWR livery too (to compete with Hornby's freeland locos, again with lined boiler bands. In 1924, a batch of Bing 0 gauge Prince of Wales 4-6-0s appeared, in correct LMS livery in connection with the exhibition of "Prince of Wales" at the Wembley Empire Exhibition of 1924-5. That the exhibited loco was a "Tishy" was ignored - the Bing model being of identical form to their LNWR liveried version issued prior to WW1. Bing may have been sent this photo, from which they took their cue for LMS livery. Bassett-Lowke, in particular, wanted their models to be absolutely up to date, and would have been anxious to secure the very earliest information on the new colours. This sometimes got them into trouble, for things changed prior to the public appearance of the real thing. 23.11.22 Contract placed with Beardmore for 90 PoW at �9,289 each and 60 tenders at �2,220; actual amount paid to Beardmore �900,120. The GM compared the practice of the LNWR and MR, as the greater number of coaches were in the colours of those two companies. The MR used 18 coats of paint and varnish as the first treatment compared with 13 in the case of the LNWR. The MR re-varnished every 15 months and repainted every 5 years, whereas the LNWR repainted every 4 years, no re-varnishing being undertaken. 1) LNW coach painted and fitted exactly in LNW style. 3) An LNW coach that had been in traffic and was about to be sent to shops for renovation. 4) A Midland coach in the same condition. 5) A coach of the same type painted outside white uppers and crimson lake base and inside trimmed with blue and the fittings walnut. He suggested that the committee should inspect them to decide the colours to be adopted and the inside fittings. 2) Passenger engines, following the recommendation for coaching stock, crimson lake. 3) Freight engines black without lining. Engines not to be named in future but those engines already named to continue with names. 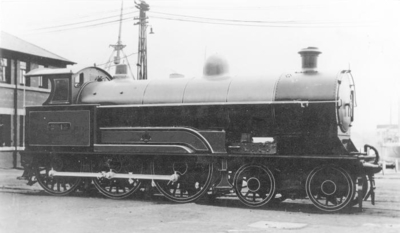 The loco was built to show the Constantinesco torque convertor at the 1924 exhibition, it was a relatively unique loco, like turbomotive. It looks like I got it wrong. That archived link told us a lot more detail. "The chassis of this locomotive was a former Great Western Railway ''Armstrong Goods'' 0-6-0 No. 395, which George converted to a 2-4-0, using the leading jack shaft for transmission of power to the other four coupled wheels from the Torque Converter. " So while the info is interesting, I got the wrong loco I'm afraid, so the mystery remains!